Perhaps the best gift I received for my recent birthday was from my friend Kevin -- he seems to have a lot of good ideas, doesn't he? -- who gave me something I didn't even know existed: White Dwarf Back Issues 1977-1987, a DVD-ROM of PDFs of issues 1-90 of the famed British gaming magazine. The product was produced by an Australian company under license from Games Workshop, but, like the Dragon Magazine Archive before it, ran into legal troubles of some sort or other (possibly regarding electronic rights, though I've heard other explanations) and was eventually pulled from sale. You can still get copies through eBay and other online sellers and that's presumably how Kevin snagged a copy for me, for which I am very grateful. White Dwarf and I have a strange relationship. I knew of the existence of the magazine quite early in my gaming career, having seen Gary Gygax's mention of it in the AD&D Dungeon Masters Guide. Likewise, some of the older guys I hung around with the early days, including my friend Mike's metalhead brother, owned copies of various issues and sometimes used variants or adventures from its pages. For the longest time, I in fact associated WD with metal, a feeling I never quite shook even after I actually started to read the thing for myself. I suspect it had something to do with the style of artwork favored in the magazine, as well as the somewhat more "shocking" content it often featured. The first issue of WD I ever actually owned was issue 32 from August 1982, which I bought while on vacation somewhere in the southern US, possibly North or South Carolina. It was that magazine that I suspect forever cemented my opinion of both WD and the UK game scene generally: weird but often quite cool. What I liked about the magazine was that it included a goodly dose of D&D, Traveller, and Call of Cthulhu each month, the three RPGs I love most in the world. There was also a strangely high amount of RuneQuest material as well, something that baffled me, given how rarely I ever encountered anyone in the US who played the game. It was years before I realized that it was a huge hit across the Pond, rivalling (and perhaps surpassing) D&D in popularity. I subscribed to White Dwarf for a period of two years from 1983-1985. It was at that point that Games Workshop started making an effort to infiltrate North America and there was a GW distribution center in Maryland. GW offered a variety of subscription deals that made the magazine very attractive in terms of cost, so I figured I should give it a try. Prior to that point, I'd only ever bought an issue here or an issue there or read old copies from the collections of people I knew. I also subscribed to Dragon at the same time and I know that, comparing the two, I always found WD to be much more uneven in quality than Dragon: its low points were very low but its high points were very often superior to those of its American counterpart. 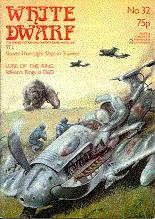 My lasting impression of White Dwarf, based on the issues I read as a younger man, is that it remained a much more vibrant, amateurish periodical far longer than did Dragon -- and that's a good thing. I'm not one of those people who worships at the altar of WD, because the simple reality is that a lot of its content, indeed most of it, was pretty mediocre. At the same time, it's mediocre in a very genuine way, being the product of fans who simply loved certain games and then decided to submit their crazy ideas to share with the wider community. It's hard to fault a magazine for providing an outlet for that, particularly when some of those crazy ideas simply blew my mind and forever influenced the way I play various games to this day. It makes what WD eventually became -- a house organ for a soulless proto-WotC -- all the more tragic. I think the hobby could use another White Dwarf right about now. Of course, I think it could probably use a Dragon as well, so what do I know? I think Kobold Quarterly is getting to be the next White Dwarf/Dragon. I really like this magazine. As for WD, you know my feelings on it, I have a nearly complete run of the damn thing. Great mag and I liked it better than Dragon. For some reason, I have always associated D&D/WH with metal. I am pretty sure it was because everyone I knew who was older than me and involved in the hobby was into metal, including the people who worked in games Workshop. Some great observations. I've actually been digging through some WDs from the late 80's / early 90's doing some research on WH40K for a little project I'm working on. While by this point the magazine had firmly shifted to a miniatures-centric content base, there are still lots of great RPG-centered articles (I think most to do with WHFRP, but whatever). Today, however, there is no RPG content whatsoever - it's purely a showcase for their miniatures, and while it is a very "pretty" magazine, I agree that it's a shame there's nothing else. Kind of reminds me of when Dragon pretty much wrote off talking about any other RPG but D&D. my opinion of both WD and the UK game scene generally: weird but often quite cool. WD ended up becoming GW's in-house organ around issue #100. It was succeeded by the excellent "Games Master" magazine and then by the (IMO) never-surpassed "Arcane", which ran for about 25 issues of unsullied excellence in the early-mid 90s. Kobold Quarterly is a seriously awesome magazine and a worthy successor to the Dragon of old. It's published by Wolfgang Baur, former editor of Dragon in the TSR days. Kobold Quarterly is a good magazine, but it doesn't quite feel, to me, like Dragon of old. It's a bit too slick and polished, for one thing, but it's also pretty solidly part of "the industry" rather than "the hobby." I realize that's a purely intangible and subjective thing, but KQ is missing that DIY vibe I want out of a gaming magazine these days. Some of this might be due to the fact that publishing is so much more accessible and digital press printing is cheaper/easier for smaller run pubs. It's much easier these days to make something look nice and give it a polished feel than it used to be. I wasn't speaking so much about its look -- though there's definitely some of that in my comment -- but more about its general "feel." KQ isn't rough around the edges, conceptually, at least not to me. Its content is all very nice, neat, and orderly. I wouldn't say it's boring, because it's not and I've liked a lot of what I've read there, but it's missing a certain insubstantial something that I can't quite explain. Little wonder, really, since most of the staff looked like they were in metal bands (and probably were! ), the miniatures pages were (and still are?) called 'Eavy Metal, and GW even had their own record label for a while. I'd agree with your assessment as far as the first half of the 80's goes, but towards the latter end of the decade, I think the magazine ironed out many of its flaws while retaining that enthusiasm and imagination. For me, Dragon always seemed a bit academic and stuffy, while WD was vibrant and irreverent. I'm incredibly jealous of that DVD. I do rate WD #50-90ish to be better, but Arcane was a good late entry, although it did often seem to have an identity crisis; it seemed rather hung up on not alienating fans of a particular game, instead of going for the WD approach of chucking a broad range of stuff in there, and if it didn't fit in with your Skyrealms of Jorune campaign, either ignore it or convert it so it did fit. "Weird but cool" also sums up my opinion of most of the British fantasy fiction scene from the late 1960s and the 1970s. I attribute this simularity in gaming to apples falling from trees. Oh, and for me one of the best things about White Dwarf was that it was very good to Call of Cthulhu, publishing a long line of scenarios running from very good to excellent, as well one of the system's best sourcebooks in Green and Pleasant Land. I may be wrong, but I think that the last non-WFRP article published in the magazine was a scenario for CoC, and a very good one at that, in #99. You might say that it's no surprise, since GW were publishing a licensed edition of CoC themselves at the time, but the support was nonetheless of high quality. White Dwarf was the only gaming 'zine I had a subscription to, for quite a long time - pretty much from WD#30-something through WD#92. I stopped after that, because Games Workshop had decided to turn it into a "house organ" which was fine, but not to my taste or interest. The graphics were almost always far superior to the rather uninspired layout of The Dragon, and the adventures were almost always a blast to read as well as to play. Combine that with the great Traveller stuff by Andy Slack, Bob McWilliams and others, and it was a really solid 'zine for a long time. "I'm not one of those people who worships at the altar of WD, because the simple reality is that a lot of its content, indeed most of it, was pretty mediocre." Yeah, like the versions of D&D (and other games I guess) the White Dwarf Magazine now bears little resemblance to what it was when it started. That's a real bummer too because it used to have a lot of great, varied material and now it's largely a glorified GW Catalog. I liked the gaming material in WD, weird or not. The old Dragon magazine was good too. I haven't found anything to really take their place. I'd love to see a gaming magazine that is broad, varied, mixed homebrew/ alternate kludgy rules, neat new monster ideas and treasures. I DO like polished looking products, but I also like hobbyist magazines over predominantly industry driven material. Hey, why don't we create something like that? While I appreciate and respect the efforts of Kobold Quarterly, it has absolutely nothing for me. It comes from the world that sees all gaming as D&D. There is nothing for any genre other than D&D based high fantasy and there is a lot of emphasis still on 3rd edition in particular. I don't consider that a gaming magazine but rather a magazine devoted to a specific product. Knights of the Dinner Table magazine has a much wider range, though it still tends to skew towards Hackmaster products. Currently, Fight On! is my favorite gaming magazine. Okay, I've been seriously looking at this since I read this earlier today and I think the option of making a magazine to fill this void is entirely doable. Completely non-biased as far as a favorite game system, game company/ publisher. Post articles on D&D 4E, S&W, WoD/ OWoD, CoC, Delta Green, DitV, all articles from the hobbyists interested in those games. Additional monsters, treasure, game tweaks, reviews, GMing advice or things learned. All the kinds of crap that should be in a magazine for gamers...without the publisher bias, or bloat that comes from magazines becoming glorified catalogues. I think people would dig it, and getting folks to write reviews or articles would be fairly easy as the hobbyist is the focus. Cool bits on upcoming releases for everything. Not just WotC stuff or WW stuff, or Indie stuff...but EVERYTHING RPG related, Old School or not. Is this an unreasonable idea? I was never a huge WD fan: I usually liked 1-2 articles per issue, at most (I wasn't playing CoC at the time, and I've still never played Traveller or RQ). I really liked "The Dungeon Architect" and the Griselda fiction, but in general, I only found 1 worthwhile piece per issue, and way too many ads. That's my major impression of WD, actually: more ads than content, despite some top-notch articles, fiction, and adventures being published between its covers. When I bought the WD archive, my impression was solidified, though somewhat softened, since I certainly have use for the CoC and RQ materials now, and perhaps even Traveller one day. Maybe it's just that during that time of my life I had a lot of time to pour over magazines, reading and re-reading, and re-reading, but Dungeon Architect articles not withstanding, I really prefer White Dwarf issues BEFORE 20. I loved the older incarnations of WD. As a previous poster mentioned, zines like Fight On! still keep that spirit alive. There are also options like Alarums and Excursions, too. Heck, there's even my Iridia zine that seeks to keep that print fanzine spirit alive. I teach copyright law in the UK as a senior lecturer. I also have read White Dwarf's 1980s contract for contributors, when I submitted some stuff to them. By the contract, contributors retained copyright in their contributions. The contract licensed White Dwarf to reproduce the contribution only twice - once in White Dwarf, and allowing for 1 reprint in eg 'Best of White Dwarf'. Thus the CD, electronic and involving countless reproductions, is clearly in breach of numerous copyrights. This is equally true in Australia, also a signatory to the Berne copyright convention. I've been trying to get some confirmable info on reprint rights for some WD material for awhile now, and your contract info sounds like a good lead. Canyou please email me at grodog@gmail.com? If you're looking for some of the old writers/contributors to White Dwarf, some of them turn up every year for the UK Battlemasters / Continuum Convention in Leicester. It's nice to put faces to those names! Despite the D&D slant, which makes it not of much use to me, I like the spirit of Fight On! a lot. It has some of that enthusiasm of the early WD, but it also has similar layout problems, which isn't nearly as acceptable now that DTP has become so easy and accessible. Fight On! would be a truly great magazine if it was tidied up a bit. My email is iggyumlaut@gmail.com. I'd be interested in hearing your thoughts on improving our layout if you have some time. I don't even know what DTP is. I feel that our layout could be better in some ways; on the other hand, I, and I think I am not alone with this, actively dislike layouts that are too busy, as we saw with some 3e and WoD books. But there's always room for improvement and if you think you could help us out we'd love to hear your thoughts. Thanks for the props, Philotomy! Issue 3 should be to lulu by this weekend. Really. :) Don't get me wrong; I love early WD, but I find that most North American gamers tend to look at it the way they might look at British TV; they only remember the superb 10% of it and then pronounce it superior to poor old homegrown counterpart (which was also 90% forgettable). But it's a taste thing, I'll grant. For my money, when WD was good, it was really good, but it didn't have the same level of consistent lower-level excellence that Dragon generally had. There is nothing for any genre other than D&D based high fantasy and there is a lot of emphasis still on 3rd edition in particular. And that right there is I think the tragedy of our hobby: it's become much too narrowly focused on one style and/or rules set to the detriment of simple good ideas usable in a variety of games and styles. I won't claim the past was some kind of glorious playground of rules-free creativity, but I do think the older games tended to much looser mechanically and thus made it easier to adapt material written for them to other games and styles of play than is true now. Mine as well. It has its flaws, but its virtues far outweigh them and those of anything extant that might even remotely be considered a competitor. Firstly, bravo: I think you've summed up WD brilliantly, in every particular. I was a regular reader from about #36 to about #120, when I finally let it go (something I should have done by #100, really); then I went on to Pyramid for a while. Runequest was big in the UK, but I don't think it ever overshadowed D&D. Overall, I think the industry landscape was flatter: people played Bushido and Bunnies and Burrows - the big games had to share a very diverse territory. too narrowly focused on one style and/or rules set to the detriment of simple good ideas usable in a variety of games and styles. What appealed to me about these two zines, which Dragon never delivered, was a sense that the material in them could be applied very broadly. I don't know how to express this, exactly - you should be able to file the stats off any bit of gaming material and repurpose it - but somehow the Dragon stuff (generally) seemed more deeply buried in a set of D&D assumptions, and not so open to mix-n-matching with whatever eccentric WW2/Vikings/Flash Gordon game you might be running. I imagine that CD contains the multi-part adventure, spread over 3 issues, that used 2 parties: one in a CoC investigative setting, the other in (Hyborea or Hyperborea). I wonder if that's worth dusting off? Ignatius, I will email you a bit later. Bear in mind that I'm no expert in desktop publishing (DTP, which probably isn't the current term), but I think there are some very basic tweaks that can be made to the layout which will greatly improve the overall look of the magazine. Richard, as I recall, that crossover adventure used AD&D for the Hyperborean half, which always struck me as odd, since there was a perfectly usable fantasy version of the ruleset in Runequest. Still, it was this sort of oddity which made White Dwarf the magazine it was. A lot of the writers for early issues of White Dwarf had honed their craft on the early English APAs such as Underworld Oracle and Trollcrusher, to name the two that immediately spring to mind. England seemed to have a much richer APA scene at the time than the US (Lee Gold's Alarums & Excursions being the notable exception), and many of the ideas and articles of early White Dwarf were drawn directly from this pool of resources. I agree that using D&D rather than Runequest for a very un-D&D-ish swords and sorcery world was kinda odd. Nice scenario, though. I think it might work well with players playing both the modern CoC PCs and the ancient D&D ones, in alternate sessions. I'm thinking of doing a short CoC along similar lines; five adventures each set in a different era, with common antagonists pulling the stories together. A twist on the traditional global campaign, with the episodes separated by time rather than distance. Anyway, one of the scenarios I'm thinking of is one set during the advance of the Hyperborean ice, likely using Runequest. It is perhaps unconsciously inspired by that old White Dwarf scenario. we could use a WD and a Dragon magazine again...your right. I loved the old White Dwarf. Of course, I had such enthusiasm for role-playing at the time that I used to read everything in it, including articles on games I didn't own. I can recall attempting to puzzle out game mechanics by reading stat blocks and the like. But it's more than just nostalgia. I also loved the irreverant style of writing, the reviews and letters, and the miniatures painting advice columns, too. I also have a lot of fond memories for The Castle of Lost Souls, which was a four-part solo adventure game that kept me busy in between sessions of D&D.